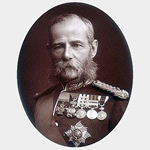 The son of a General, Lord Roberts of Kandahar Pretoria and Waterford was born in Cawnpore, India. Eton College, Addiscombe Military Seminary, Royal Military Academy Sandhurst. Governor of Wellington College from 1899 to 1914. Joined the Indian Army. Nicknamed 'Bobs Bahadur' (Bobs the Lion) and later just 'Bobs'. Natural causes is attributed those deaths due to causes that were not directly associated with the war. Included in this are wartime deaths resulting from the Spanish Influenza pandemic and its associated pneumonia problems and other attributions such as age and exhaustion. He was initiated into Khyber Lodge No 582 on Christmas Eve 1853, a military lodge founded in Peshawar and was made an honorary member of the Old Wellingtoninan Lodge at its second meeting in 1910. He also joined the Aldershot Army & Navy Lodge No 1971, then ruled by the Duke of Connaught & Strathearn, and Lodge of Edinburgh (Mary's Chapel) No 1 (under the Scottish Constitution).